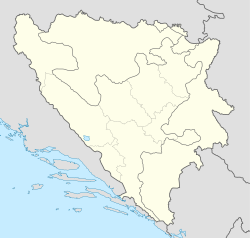 Miruše (Serbian Cyrillic: Мируше) is a village in the municipality of Bileća, Republika Srpska, Bosnia and Herzegovina. ^ Official results from the book: Ethnic composition of Bosnia-Herzegovina population, by municipalities and settlements, 1991. census, Zavod za statistiku Bosne i Hercegovine - Bilten no.234, Sarajevo 1991. This article about a location in the municipality of Bileća, Republika Srpska is a stub. You can help Wikipedia by expanding it. This page was last edited on 26 March 2017, at 05:14 (UTC).